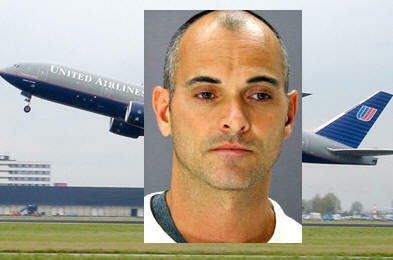 August 28, 2013 - A German national who used to work for United Airlines pleaded guilty Monday to making false bomb threats against flights operated by the international air carrier. Patrick Cau, aka Patrick Kaiser, 40, who recently relocated to Dallas from Los Angeles, pleaded guilty Aug. 26 to one count of false information and hoaxes. Cau pleaded guilty before U.S. District Judge Otis D. Wright II, who is scheduled to sentence the defendant Nov. 18. At sentencing, Cau faces a statutory maximum penalty of five years in federal prison. Cau pleaded guilty to one felony count. In a plea agreement filed in federal court earlier this month, he admitted making eight bomb threats to United from October 2012 through January 2013. In his first phone call Oct. 4, 2012, Cau used a pay phone near his home to call an internal United crew-scheduling number and stated that a United flight from London to Los Angeles would be bombed later that day. The subsequent calls were made to 911 from pay phones in Los Angeles, New York City, Las Vegas and Seattle. All the calls stated that a specific United flight would be bombed. As a result of the hoaxes, multiple law enforcement agencies were forced to respond to Cau’s bomb threats. These law enforcement responses included: evacuating people from the targeted airplanes; towing the aircraft to a safe area; searching and re-screening all ticketed passengers, baggage and cargo; and searching the aircraft by human, canine and other detection methods. As a direct result of Cau’s threats, United experienced substantial disruption to its business operations and services, including cancelling and delaying flights, transferring aircraft, and significantly inconveniencing United passengers. As a result of his actions, Cau has agreed to pay $267,912 in restitution to United. Cau is also expected to be ordered at sentencing to pay an as-yet-undetermined amount of restitution to law enforcement agencies that responded to the bomb threats. The case against Cau was investigated by the FBI, U.S. Immigration and Customs Enforcement’s (ICE) Homeland Security Investigations (HSI), and the Los Angeles Airport Police.